One single act of kindness becomes an endless reign of terror. . .
And from that moment the killing of the Bryce family becomes a mere formality - and a grisly attraction. Notice of Kellie and Tom's deaths has already been posted on the internet. You can log on and see them on a website. They are looking good dead. I've got quite a collection of Peter James books and I'm slowly but surely getting round to reading them. 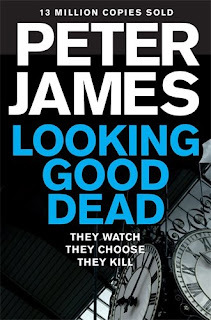 Despite the appearance of a reasonably chunky book, I've found that Peter James books are very quick reads as you simply can't put them down and this second in the Roy Grace series is a real page turner. Looking Good Dead draws you in straight away when we're introduced to trainee lawyer, Janie Stretton. 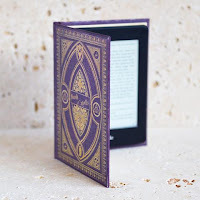 Janie has expensive tastes and certainly dresses the part but before the reader can form an envious thought, we find that somebody has Janie in their crosshairs and her time is almost up. Businessman Tom Bryce is on a train home to his spendaholic wife, Kellie, when a loudmouthed passenger accidentally leaves a CD on the seat. Tom picks it up and naturally puts into into his computer in an attempt to identify the man who left it, but Tom gets a lot more than he bargained for when the CD directs him to a site where he witnesses a murder. The CD wasn't meant for Tom, so now that he's a witness to murder he's also become a target. Crikey! 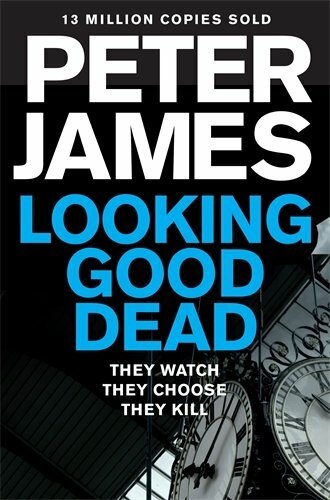 You need to clear your diary when you pick up a Peter James book as your life will be on hold whilst you are reading it. This is only the second book in the Roy Grace series but I've already formed quite an attachment to him. As mentioned in book one, Dead Simple, Roy Grace is still haunted by the disappearance of his wife, Sandy. The Sandy thread is picked up again when Roy visits mediums in the hope of finding out what happened to her. Roy has enough to keep him busy with this new case though, especially as he's threatened with a move to Newcastle if he doesn't show results, that's if DS Branson's F1 style driving doesn't kill him first. I'm getting to know the team better too and I found Norman Potting to be shockingly hilarious - he is Mr Politically Incorrect but he's a good old fashioned copper and an asset to the team if you can keep his mouth shut. Looking Good Dead is another brilliant instalment in the Roy Grace series and it won't be long before I pick up book 3: Not Dead Enough. Gripping, addictive, compelling and extraordinary, Looking Good Dead is a superb addition to the exceptional Roy Grace series.